For tender oven-roasted beef brisket that practically quivers on the plate, the key is to cook it low and slow. If you're too impatient to deal with that just know that most of the time is hands-off. So you can hang in the kitchen and binge watch your favorite show. (Just remember to set a timer!) When the brisket is done, serve it with a quick homemade Russian sauce, sauerkraut, and toasted rye. 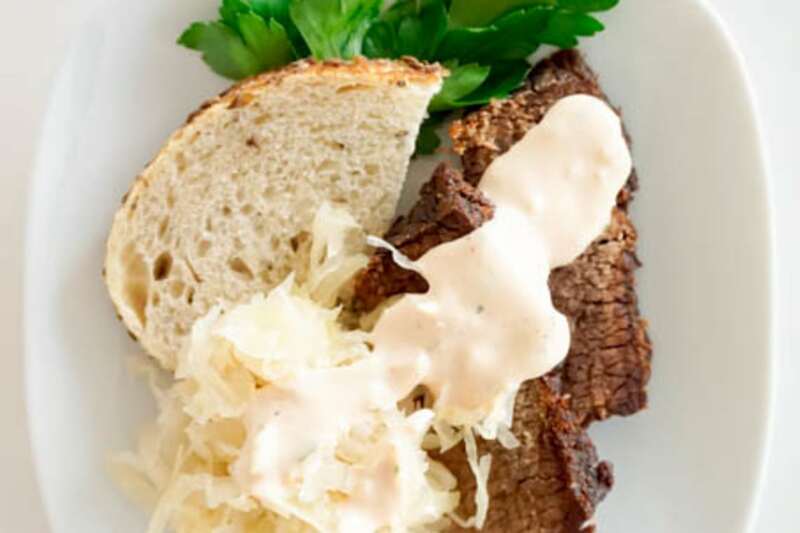 The result is a crowd-pleasing main course that's reminiscent of reuben sandwiches. To make the brisket even more tender, be sure to slice it across the grain. Find the little lines running along the meat. That’s "the grain." Hold your knife crosswise to the grain then slice. Per Serving: 800 calories; 57g fat; 21.5g carbohydrates; 49g protein; 178mg cholesterol; 1181mg sodium. The white Russian sauce was really zesty, which I love. The horseradish and hot sauce really added that special something. It paired nicely with the brisket and rye bread. Very filling! Delicious! This was my first time making Russian sauce from scratch! I wasn't sure how it would taste on brisket, but I am super impressed and happy with results. This is great for holidays or entertaining guests. I can't wait to make it again!